The definition of a 'Shaman' is a practitioner who alters his/her state of consciousness to communicate with the spirit realm and channels those transcendental energies into our three dimensional reality. Shamans are known to heal illnesses, advise communities in difficult times and have a huge knowledge about native plants and their properties. You will find ancient shamanic practices and practitioners in every continent all over the world, the most known about are probably the tribes in the Americas. Shamanic lineages often go way back through ancestral lines and the teachings and initiations are passed on from elder to scholar. So you cannot 'just study' to become a real Shaman! It is a life long journey and (not an easy) mission.
? Neo Shamanic movement ? At most festivals, parties with a 'hippie' touch you will see it. 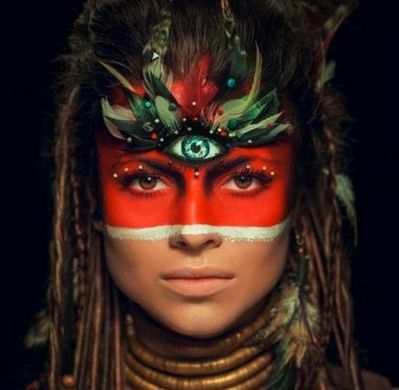 Feather headpieces, tribal facepaint, 'mystical' appearances. The New Age community is going nuts for anything with a 'shamanic' label on it. What is behind this sudden craze - I would almost call it a trend? What is real and what do we need to be mindful (and careful) about? In my opinion the term 'shamanic' is being used very lightly. It seems like everyone that has been to Peru can organise and hold an Ayahuasca ceremony (sorry if I sound too critical!) I certainly believe that these ancient practices are not for everybody, especially if you haven't had experience and training. Through actual shamanic work we open our consciousness and connect to spirit realm. If we don't know how to navigate this world, this is not always safe. There have been cases of (dark) spirits taking over people's bodies and possessing them, or even people dying in ceremony when it was not held properly. Why are we so crazy about shamanic practices? In the overly stimulated, confusing times we live in I am not surprised that those ancient traditions have become popular with the western world. We want to overcome our fears, we want to liberate ourselves from our ego and suffering. We want to expand our consciousness and connect to what we cannot see (spirit). So learning more about shamanic practices as a way to become a 'better person' seems like a good idea. However this does not mean going to a party looking like a flying eagle gets us closer to communicate with spirits and gain deep knowledge about the healing arts. I believe contrary that there is the danger to feed the ego, to put ourselves above others who 'don't know'! And how would the tribes deep in the amazon feel if their practices are being unconsciously ridiculed?? (I do not want to offend anyone who likes to dress up for parties, I am criticising pretentious shallowness and a big ego that I sadly notice quite often....). So what can we learn from this occult phenomena and how can we translate some learnings into our modern world? 1. Learn about the different shamanic cultures in South America, Asia, Russia, Europe and Africa... all those cultures have so much history and tons of knowledge and wisdom to offer. By learning about them we connect to our ancestors and to their 'magic'! 3. Be in nature and open all your senses. Listen and feel. From a shamanic point of view everything around us is inhabited by spirits. Every animal, rock, plant, ... . Take a walk, connect your feet into the earth and look around you. What can you see, hear and feel? Maybe a certain animal shows up more often than others. Maybe it has a message for you. 4. Create ceremony. No! You don't have to drink ayahuasca or peyote. You don't have to get high on magic mushrooms (although under REAL and SAFE guidance one can experience a transformation). You can bring more ceremony into your life. If there is something you wanted to let go for a long time, make a fire, sing a song, do something symbolic, something significant that invites the intention. How you prepare your food can become ceremony. Stay present while you prepare, sing or recite your favourite poem as you cook. Add love from your heart into the ingredients. You are the creator so get creative! The above points that I have mentioned may be not 'ancient tradition' and by no means do I want to call it Shamanism. However I believe that we can learn from our ancestors and the healing arts of REAL shamans and REAL modern shamanic practitioners (who absolutely exist and bring beautiful wisdom to our community) to connect more to our Mother earth, to plants, to animals and therefore to ourselves. Just through simple practices we have the chance to look at our wounds and find healing. In our Sacred Space Retreats (which I have titled 'shamanic', however I am thinking about changing the title because of the widespread misuse of the term) we will explore many of the practices mentioned above and we will learn a lot about ceremony and ritual. You will also gain insight into 'plant medicine' and be able to try it. Everything that will be offered at our retreats is 100% LEGAL AND ABSOLUTELY SAFE! You may experience euphoric feelings and deep transformation, however no practices that could be dangerous or where we feel we cannot hold the space will be offered. There is one last minute space available in a shared room due to cancellation at a discounted rate for the 17 September!!!!! Don't miss it! We still have 3-4 spaces available for the "Sacred Space" retreat starting on the 30 September. Check out the page for more info or email us.